Unless you’re gluten-free, you’ve probably tried some version of Cali’s Natural Foods’ “Tender Tigers”. These vegan wings aren’t just available at Sage’s, Vertical Diner, and Vertical Pizza, they’re at several restaurants across the valley like Piper Down, Ice Haüs, The Green Pig, Funk N Dive, The Garage on Beck, and Trolley Wing Company. Which got us thinking, just how much Tender Tiger is being eaten in SLC? The answer, we learned from owner Ian Brandt, is an average of 550 pounds every week. Let’s break that down. We hate talking dead body parts, so in brief, it costs one bird’s life for only four pieces of chicken wings 1http://theplate.nationalgeographic.com/2015/01/30/wings-for-the-super-bowl-and-what-happens-to-the-rest-of-the-bird/. Factory Farms breed chickens to grow so large so quickly that their bodies often fail before they leave the crowded warehouses, and those who make it are only 5-7 weeks old when they are thrown onto transport trucks and hauled to the slaughterhouse2https://www.peta.org/issues/animals-used-for-food/factory-farming/chickens/. Two birds suffer and die needlessly for just one serving of wings. But onto the good news! With local Tender Tigers from Cali’s alone, 67 chickens are saved every week by people choosing to order vegan instead of chicken wings. That’s nearly 3,500 chickens each year, and with awards like PETA’s Top 10 Wings in the Country, it’s bound to only grow from here. And with vegan options like Tender Tigers showing up in menus in restaurants that serve meat, some patrons are surely choosing to replace meat with cruelty-free versions of familiar foods, sparing animals at every meal. It’s easy to get lost in the sea of depressing images and stories about the many ways animals suffer in our society. But together, with our simple consumer choices, we are making a difference. 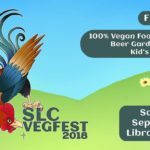 Think of the 67 chickens who didn’t have to die for wings cravings in Salt Lake City this week.